The SS JoyPad DX is a third-party controller for the Sega Saturn. It was marketed by VIC Tokai in Japan, though judging from its similarities to the SS JoyPad AI, it was likely manufactured by a different company (one which is currently unknown). 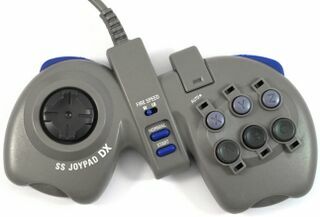 The SS JoyPad DX is a strangely-shaped Saturn controller with turbo features.